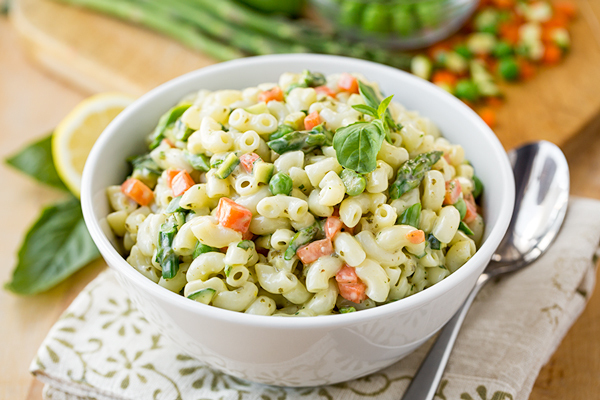 A colorful, healthy and delicious macaroni salad with spring vegetables and creamy lemon-basil dressing is the perfect little offering for the season when fresh is what is craved; it is also the perfect picture of the bright and lovely hope that the spring season provides us with, hope in renewal and rebirth, and beginning anew. Each year, when spring makes its lovely entrance, I seem to fall more and more in love with it. Because I live in a part of the country where the climate really begins to warm up around this time of year, spring has, in the past, always felt a bit more like a short little blip on our radar screen that’s just simply there to help usher in the heat of the upcoming summer; but for some reason, perhaps because I’m maturing a little more each year and learning to take more time to be present in the moments of each day, I am experiencing the hope that this beautifully floral-scented and crisp season holds within it, and am seeing it more and more for the inspiring season that it is. Spring is a time when the colors of nature are beginning to show themselves after the deep slumber of the winter, and when the air is heavy with the perfume of tiny flowers and precious buds that are finally able to pop up and come out to play. It is a time when life is renewed, when the possibility of wonderful things happening is evident just about everywhere if our eyes are open to see those possibilities, and where growth and change—rebirth—is what every living entity is urged to undergo. There’s a lot of hope to be found in the spring, a lot of potential for great things to be born. There’s a freshness and a brightness to the foods that we are now beginning to crave, and their colorful crispness can do our bodies good. 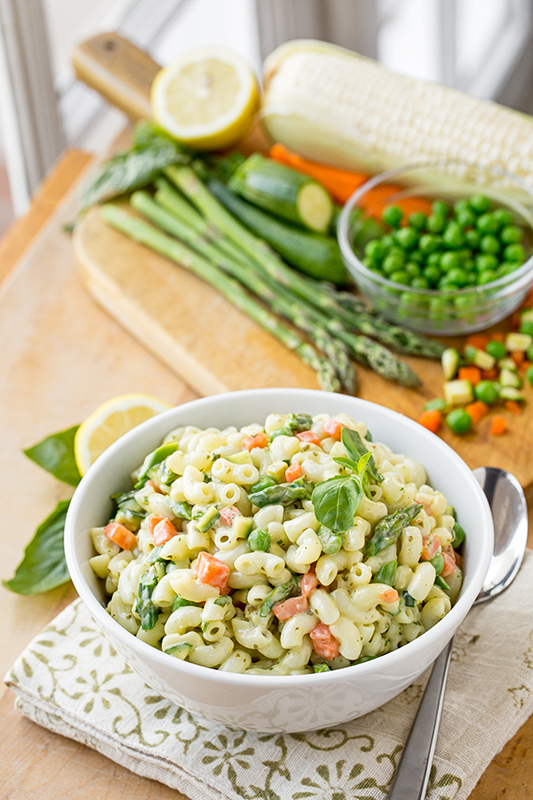 A tasty and simple little macaroni salad can be a tremendously comforting thing when it’s speckled with the spring jewels of green peas, asparagus, colorful carrots, sweet corn, and baby zucchini tossed together with a creamy and lemony dressing; it can be a representation of the beauty and the refreshment that our souls long for that they can only find in the elegant spring season, chock-full of its bright and enthusiastic nature that beckons us to come out and mingle with it. The hope that springs eternal in the spring is something that I never want to take for granted, never want to not fully embrace and drink in. Spring is a reminder that we continue to evolve and to change, continue to step out of our old ways and into newer, fresher, and brighter ones. This is a season that reminds us that, indeed, we have been somewhere, and have experienced some things, and have even grown a little in the process; and the only reason we can recognize this is because in our impulse to move forward, we also can’t help but look back and examine what has been, and crave an opportunity to, once again, begin afresh, perhaps a bit more wiser this time around. 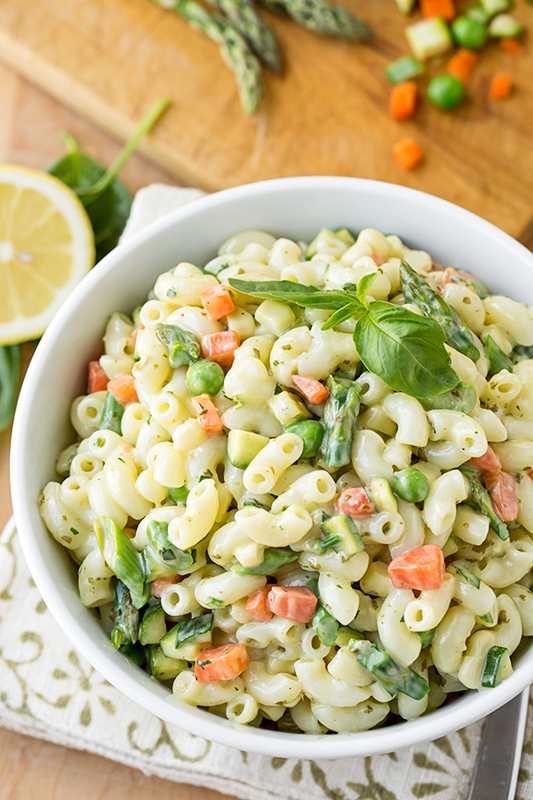 -Place a small pot of water over high heat, and add a good amount of salt into it; once it comes to the boil, add in the diced carrots, and blanch for 2 minutes; then, add in the corn and the asparagus, and blanch for 30 seconds longer; drain the vegetables and add into an ice bath to stop the cooking and lock in the vibrant color; drain and pat dry. 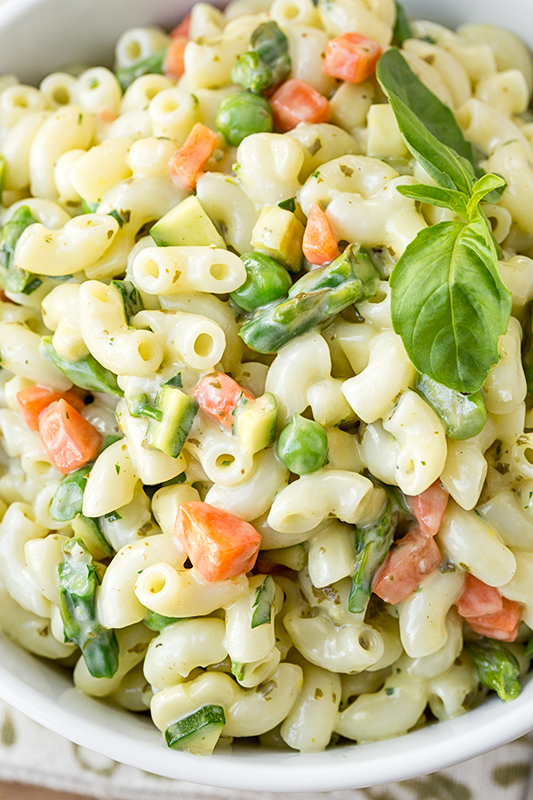 -To assemble the macaroni salad, add the blanched veggies into the cooked and cooled macaroni, along with the peas and the diced zucchini; toss with the dressing, and place into fridge to chill for at least 30 minutes (you can even do this a few hours ahead); serve chilled garnished with a little basil leaf, if desired. 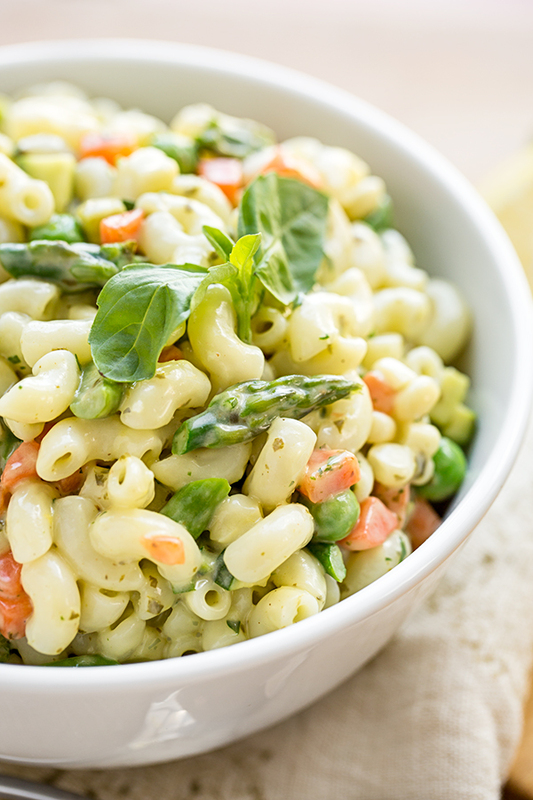 -Place all ingredients except for the olive oil into the bowl of a food processor, and process until smooth; with the processor running, slowly drizzle in the olive oil until completely incorporated and the dressing is emulsified and well-blended. -Use immediately, or keep in a covered container in the fridge if making ahead. 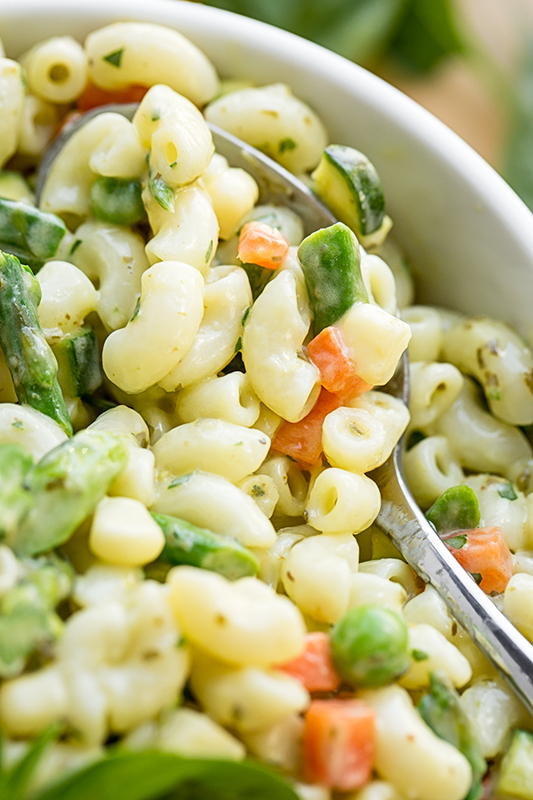 I will make the Mac salad, because I love macaroni salad. Hi Polly! Hope you do!